A flowmaster 40 SI/DO with 3 inch chrome tips I love it! Has great power and when i get on it lets people know I am coming. Looks killer on the truck, and it isn't extremely loud which is what I wanted. I can't stand when engine noise drowns in the cab. I can get it for $416 shipped. It is not a glasspack it's a muffler and Iran the exhaust for a couple of weeks without tips and wasn't very happy. Put the tips on and it gave it a much better (and a little louder) sound. The volume is comparable to a 40 series flowmaster, I went with Cherry Bomb just because I liked their phrase "Disturbing the peace since 1968." I simply installed an extension into the factory clamp (the one furthest from the engine before the stock muffler) so that i could mount the Magnaflow near the end of the heat shield allowing for a nice professional looking hanger mount. I topped it off stealth style with a short 6 inch piece between the outlet of the muffler and a polished SS rolled edge tip. The polished muffler and tip show up nicely from the rear passenger wheelwell and when sitting in a car behind me. I love the sound because of the throaty sound without the drone inside and the cackling when you let off the gas. The way that I mounted the muffler eliminates all the bends in the exhaust system after the y-pipe following the factory resonators. 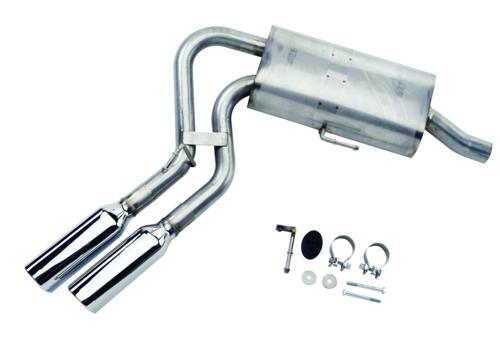 Magnaflow catback, dual exit. Haven't received it yet; but it was down to that or the JBA system. Wanted the Roush off-road system, but I like my neighbors. ....well, most of them anyway. Installed my system over the weekend (catback, SIDO), along w/ a CAI. This system sounds great! Loud accelerating, but very quiet cruising. You only hear a light burble from the exhaust when in overdrive; but let's people know where you are when you're gettin' on it! Highly recommend this system to any anyone who is worried about drone at highway speeds; yet wants an agressive sounding system. No idea on whther or not it has improved mileage as some claim; but it is more responsive; and doesn't feel as though it's laboring to get out of it's own weight anymore. Last edited by BlackSTX; 10-01-2008 at 07:24 PM. Reason: udated info. wow am i the only one with a borla system......sweet. its nice though. quiet rumble while idling and below 1500 rpm but louder than all heck at 1600 or higher.